In 1908, a space rock 120 feet (37 meters) across hurtled through the Earth's atmosphere and exploded over Siberia with the energy of 185 Hiroshima bombs, demolishing 800 square miles (2,072 square km) of forest in a matter of seconds. That devastating impact, known as the Tunguska event, is just one example of what could happen if one of the massive objects hurtling through our solar system were to take a collision course with Earth. Luckily, NASA's doing something about it. It plans to try out an asteroid-deflection technique involving a pair of space rocks, a refrigerator-sized spacecraft, and one badass crash landing. The thought of dying by asteroid impact might sound far-fetched, but it's more realistic than you think. In 2014, Tulane University professor Stephen A. Nelson crunched the numbers and found that in your lifetime, the odds of dying from a large global asteroid or comet impact—"global" as in big enough to wipe out our species—are 1 in 75,000. Sounds low, sure, but it's higher than your odds of dying in an earthquake (1 in 130,000), and much, much higher than winning the lottery (1 in 195 million). The number of potentially devastating space objects that pass dangerously close to our planet is sobering. As asteroid impact expert Alan Harris tells Astronomy Magazine, about 200 million objects measuring 20 feet (6 meters) or greater are in Earth-crossing orbits. About 10 million objects 65 feet (20 meters) or greater—like the one that broke up over Chelyabinsk, Russia in 2013—are in the same vicinity, and one passes within the orbit of our moon nearly once a week. And Tunguska-sized objects? They pass within our moon's orbit several times a year. This illustration shows the orbits of all of the so-called Potentially Hazardous Asteroids — those bigger than 140 meters across that come close to Earth — known in early 2013. That's why NASA's Double Asteroid Redirection Test (DART) can't come soon enough. The mission would send a spacecraft to Didymos, an asteroid binary system where one 530-foot (160-meter) asteroid, Didymos B, orbits a larger half-mile (780-meter) asteroid, Didymos A. The plan is to send DART to Didymos, where it would use its own autonomous targeting system to hurl itself at the smaller Didymos B at approximately 3.7 miles per second (6 km per second)—nine times faster than a speeding bullet. Even though it's a craft the size of a refrigerator crashing into an object wider than a baseball field, over time, the original nudge should add up to a big change in the asteroid's flight path. The fact that Didymos is made up of not one, but two asteroids is the real genius of the plan: if we deflect the orbit of one asteroid while leaving the other undisturbed, we can see exactly how far off-route we knocked the target asteroid by comparing it to its partner. Didymos should have a distant approach to Earth in 2022, and again in 2024. Although the asteroids won't be close enough to threaten Earth, DART will be a proof-of-concept to show that we could deflect a threatening asteroid when that day inevitably comes. 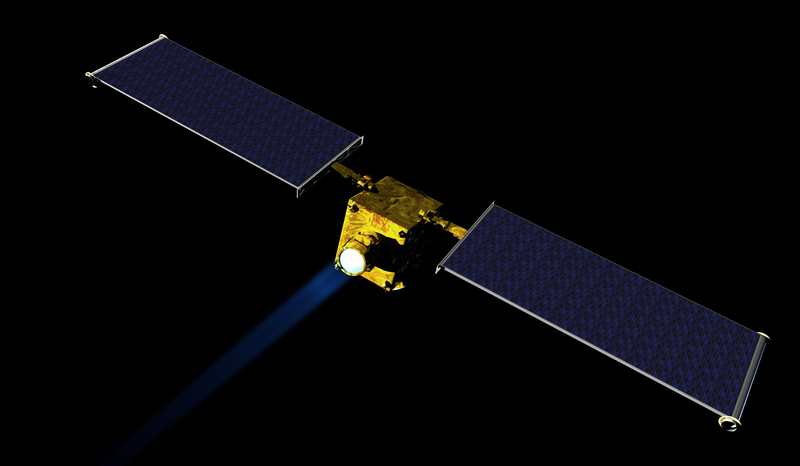 "DART is a critical step in demonstrating we can protect our planet from a future asteroid impact," says mission co-lead Andy Cheng.